Hey! another new reader here! This is the most amazing story ever! I'm dieing to know what happens next. PAMS! 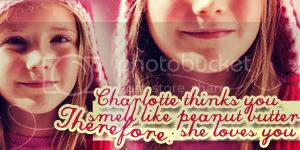 Last edited by lena lovegood; 03-14-2007 at 12:42 AM. Hey! Really good FF, its the second one I've read and I really like it. The point of view is really awsome BUT why is it so dead Make a big juicy post! Not to get everyone excited over nothing but, we ARE planning to finish this fic. I know it's been almost a year since our last post but, I promise we haven't forgotten about it and we are currently plotting up our next installments. Thank you all so much for your praise and encouraging words, they really do mean a lot to us. Location: Dunno... Can you tell me?? **new reader alert!! **Ok, I've been here all this time and NEVER realized stories like this were going on in here. I love this one particularly, because it shows a Slytherin actually CARING about someone that isn't Slytherin. Could it be that he actually likes this person, and the banter is one that is akin to a couple who can only show their feelings for each other this way? No clue. I love the two person POV in this. Keep it going! I can't wait till the next installment! I just got back from vacation and I had hoped there would be another post. Oh well, I can't do anything about it, I'm completally hooked on this story! It's so good! PAMS!! This is a wonderful story! I'm looking forward to an update!!! when are you going to post???? This signature block is NOT long enough. OMG this story is so cool!! I love it! It's really interesting how its written I never would have thought of doing anything that way! We won't talk about how long it's been, but suffice it to say... we'll finish this. We promise. WE're ready. Chapter guide now up in the first post. I saw a Muggle picture once about a man in a coma. He seemed to wake up all at once, and he blinked sleepily at his family as if he’d had a lovely nap. And that was it! He was just awake and everyone was brilliant and they lived happily every after. And then there was me. Hannah said that I woke up several times, just enough to flutter my eyelids and then go back to sleep, but there was a day that I first remember being aware of the room I was in. There was just darkness for a while, although I could hear some voices chatting. Arguing, in fact, over whether or not unconscious people want to hear articles from Witches’ Weekly about which Quidditch players have gained the most weight. For the record… they don’t. The next thing I noticed was the smell. My bed at home smells like lavender and chamomile, but the flat pillow under my head smelled about the way it felt. Or maybe it was just that my mouth tasted like rabbit fur. Not that I’ve ever eaten rabbit fur. My eyelids fluttered, but the room was just so bright. Not just bright, but stark and white and blinding. It took a few tries before I could open my eyes completely to take it all in. The sight of the Mungo’s hospital room made me want to slip deep back into a coma again. I had to be the worst Auror ever if I was in this bed, and try as I might, I couldn’t remember how I’d got here. Hannah was holding my hand, which you would think was a sweet thing to do, until you realized that she was painting my fingernails a sparkly pink color. She grinned happily as soon as she saw me open my eyes. “Hullo, Sue. You really do want to hear about Quidditch players, right? Tell Neville. He’s been beastly about it.” She made faces at her husband, who I spotted lurking near the door. Oh, he’d brought me a plant. Shocking. “Did you put a rabbit in my mouth?” I whispered, my voice scratchy and scarce from disuse. I studied the shiny leaves of the plant Neville had brought. Was it fake? Honestly, that was insulting! “Like a house fell on my head, and then someone fed me a rabbit with the fur still on,” I protested, my voice sounding like rusty pipes. “I don’t have any more brain damage than before. Could I get some water, please?” Neville rushed off to find a cup. Hannah admired the nail polish before glancing up at me. “I really am glad you’re awake. I was worried about you.” For all of her pretended silliness, Hannah was a sweetheart and my very best friend. “Sale at Malkin’s you need me for?” I closed my eyes and let her do her worst to my poor hands. “Someone has to carry my bags,” Hannah insisted. “You owe me too, because Weasley kept asking strangers to give you a sponge bath. I don’t know why Hermione lets him stay in the house.” Her voice was so light, I knew she was keeping something from me. She gave me a sharp look. “Nothing, really. Two broken ribs, broken wrist, ten stitches in your head, both shins broken, and a really nasty knock to the head that kept you out for a few days. You’re fine.” Perhaps being an Auror had jaded me, because that did sound fine. “Then what’s the look about? It can’t possibly be because the Quidditch players are all gaining weight. They ran a similar article two months ago. Just say it.” My throat hurt from all the talking, and my head hurt from the worrying. It’s easier to deal with worry when you know where the attack is coming from. “They want you up at the Ministry as soon as you’re on your feet,” Hannah tossed her magazine on the floor. “For Nott’s trial. He’s going to be sentenced to life in Azkaban, but they still want your testimony. Stupid really. He’s already there, you know. Azkaban. I don’t know what difference it makes if you’re there or not, since they have everyone else’s testimony…” I let Hannah prattle on. I really did surround myself with long-winded friends, didn’t I? Mine eyes deceive me - new update? Too bad its sooooooooo not like that. Never know it could be good. The sight of the Mungo’s hospital room made me want to slip deep back into a coma again. I had to be the worst Auror ever if I was in this bed, and try as I might, I couldn’t remember how I’d got here. No, not the worst Auror just one who is in active dangerous duty. Hannah was holding my hand, which you would think was a sweet thing to do, until you realized that she was painting my fingernails a sparkly pink color. Hooray for pink! Nonnie would approve. “They want you up at the Ministry as soon as you’re on your feet,” Hannah tossed her magazine on the floor. “For Nott’s trial. He’s going to be sentenced to life in Azkaban, but they still want your testimony. Stupid really. He’s already there, you know. Azkaban. Interesting to see what she says. I let Hannah prattle on. I really did surround myself with long-winded friends, didn’t I? All the better for quiet people who don't want to think up things to say. I love you guys - looking forward to Kris' post! oooooh Yay! I didn't know you guys were working on it again! I hope you keep going! Every old Auror goes to Heaven, but he has to stay in Hell a while first. Since the first day I became an Auror, I had heard the old adage bandied about by the aging Aurors in the office. It didn’t mean a single thing to me until I arrived at Azkaban. It wasn’t exactly where they came to die, but most of those aging Aurors took shifts at Azkaban once they were too old to be in the field. As I stared up at the brick wall in front of me, waves crashing against the old stones and spraying my carefully straightened hair, it wasn’t hard to figure out why they referred to this place as Hell. It was dark and depressing, even without the dementors. I banged carefully at the hinged doors, immediately having to pull a splinter from my knuckle. This place was miserable, and I wouldn’t wish it on my worst enemy. Except that I sort of had, and now I had to try to make it right again. Having a conscience was such a burden. What must it be like to be a Death Eater and have no conscience at all? I probably never would have had a house fall on me, that was for sure. My newly healed ribs still pulled when I stretched, and I was waiting for the faint pink scar in my hairline to disappear. Once the wooden door swung open to admit me, I paused in the drafty corridor to straighten myself out. Last time he’d seen me, I was looking particularly grubby and unconscious, and he’d obviously had the upper hand. I don’t know what I was trying to prove by starching my robes so that they barely moved and wrapping my hair in a rather too-stylish French twist. I didn’t really care what he thought of me, afterall. I just didn’t want to be the silly little Hufflepuff in a hole to him. I wanted to be the big impressive Auror. A grown up woman Auror. “That’s a good girly. Less’go.” He hobbled down the long corridor, and I scurried after him. After a few hurried steps, I slowed and threw my head back, trying to walk like the calm and cool Auror I knew I was. Grubbins threw open a door, and I paused outside. So much for calm and cool Auror. There were a lot of things to say, and I wasn’t sure in that moment that I could remember my name. “Girly!” He pulled back the huge latch on the door and gave me a look. “Less’go! I nodded at him shortly and stepped up the opening door. I have to come back though. Just peeking this time. I had been sleeping, I think. I couldn’t remember if it was day or night or how many days, weeks, or even months I had been sitting there, bored to tears and convinced I would go mad even before the trial. Then, I heard the click of a key in the lock, saw the outline of a shape in the darkened hallway through the cold iron bars of the only window in the entire cell, and then the guard entered. Without a word he and a fellow came at me and I was bound with anti-magic shackles. I was forced to my feet and then led under a careful guard to a meeting room of sorts. They refused to tell me who I was meeting and insisted on escorting me all the way to the most uncomfortable of the two chairs, pushing me in it and then ensuring the chains snaked through the appropriate rings on it before stepping out of the room. It was only after the guards left that I looked up from my feet which I had been staring at since the moment they entered my cell and found Bones sitting across from me. She folded her hands on the shaky little table between us and watched me without expression, though I guessed she was probably searching for something to say. "Hi," was the best she could come up with as I sat in chains in front of her after saving her life. "What are you doing here?" I asked, not managing to keep the bitterness out of my voice and I didn’t care either. Stupid girl. She was supposed to stay awake to keep me out of this place and here she sat saying “hi” without even an apology for being such an idiot and landing me in this mess. Her face tightened in spite of how blank it had already been. "Very friendly, Nott. I should think you'd want visitors." Visitors?!?! She thought he wanted visitors?!?! He wanted out of here?!?! I would have screamed at her if I thought it would help but, Bones and her Hufflepuff ways probably wouldn’t even understand why I was screaming at her. "I told you not to move. You moved and then you passed out before you could tell them I was innocent," I said in a rush and with an accusing tone. It was all her fault I was here and I'd had nothing to do but convince myself of that while I sat in prison doing nothing. She quirked the corner of her mouth, seemingly tempted to smile. "You've been wanting to say that for a while, yes?" Was she patronizing me now? What gave her the right to patronize me after all she put me through? I was seething and perhaps it was a good thing I was chained to the chair and unable to perform even the simplest of magics. "Don't laugh at me. I'm going to be in here forever and you're laughing?" I asked as I glared at her. "Why are you here? To gloat?" She shook her head. "For all that you spend so much energy on feeling misunderstood and mistreated, you really make no effort to understand other people." Bones studied her hands. What did she expect when I was being misunderstood? That I’d just roll over and accept being misunderstood and then put forth effort to make sure someone else’s feelings weren’t being hurt? It was such a Hufflepuff thing of her to say. Soft. That’s what they were; they’d let you walk all over them if you wanted. "Forgive my impatience but, I'd like to know why you're here," I sighed and wanted to rub my temples but, couldn't due to the restraints. I sighed again and realized I didn’t want to be here; I’d rather sit alone than deal with Susan Bones again. "It's more comfortable in my cell. I love the creativity of this story. Its such an unusual plot, and such unusual characters it makes for a really good read. Keep it up! I am officially eagerly awaiting the update for this story. We're so close to being done, folks. Just bear with us a bit longer. Wow. Nott would rather be in his cell than chatting with me? I gave him a hard look. "Forgive me for not being flattered that you prefer solitary confinement to my company. Maybe I'll just send you back there." I rose to my feet. Dramatics sometimes came very naturally to me. "You're not chained to your chair," Nott complained. The whiner. "If you're just going to sit there arguing with me, then I might as well go back." Honestly, at that moment, I wished I COULD just send him back to his cell. Serve him right, the measly ungrateful snake. Instead, I chose a more… forceful approach. I leaned forward and banged my fist hard on the table, letting the clang echo around the room before speaking. "I'm not arguing with you. Why are you always so quick to take offense?" The hitting and the yelling DID make me feel better, but only for a moment. It wasn’t in my nature to be intentionally cruel. Closing my eyes, I counted to ten and took a deep calming breath. "They asked me to testify at your trial, you know." "I'm surprised they even bothered," Nott replied. "And perhaps I'm quick to take offense because you Aurors are quick to jump to conclusions." Not exactly the curious, grateful response I was hoping for. Too quickly, I was caught up in arguing with him again. "Saying you Aurors is like saying 'You Hufflepuffs' or 'You Slytherins'," my eyes flew back open and I glared at him. "But I… admit that I may have been hasty in my judgment of you." He didn’t deserve that admission a bit. "Yeah? That makes me feel so much better," he replied, unable to keep the sarcasm in check. His voice was dripping with it, and I was suddenly very tired of fighting with him. "Won't give an inch?" I sighed. In its own way, his anger and lack of interest in the outcome of his own trial made a sort of sick sense. "You think you're just going to live and die here, don't you? Have you lost all hope?" He studied the top of the table with the expression of a sullen little boy. "Yeah, that's pretty much it. I don't know if it's better or worse that the Dementors are gone," he replied, trying to sound as if he didn't care. "You're so certain that I wouldn't go to court for you?" I couldn’t help but return to my seat when he was being so… nearly decent. Perhaps we could make it through one conversation with a peaceful outcome. Nott scoffed, and I’m sure he would have rolled his eyes if he were willing to look up from the table. "Would they even believe you? Obviously I injured you on purpose and then obliviated you or put you under the Imperius curse. Yeah, the Imperius curse, and there's no way they'd know." You know, it was REALLY starting to hurt my feelings that everyone thought I was so worthless. My voice rose again and I pounded the table for emphasis. "I'm an Auror! My word has weight to it, Nott, whether you find it to be true or not." "Fine," he said, pouting. I wondered if he cared at all about the outcome of his trial, but he finally couldn’t help but break the silence. "Are you really going to testify in my defense?" "The trial was yesterday," I answered tersely, sticking my lip out just like his to mock his pouting. I just found this story and I'm hooked! I love that you brought to light some very minor characters, love their interaction, it's brilliant! Can't wait to see how it wraps up. Please post more soon! I'm so glad you're hooked!!! I'll be posting a Nott update as soon as I can but, it may be a few weeks because I'm in the middle of an intensive 5 week class. I love it. How Nott tries to think he dosent care. Very Good. as soon as you can!!! !